Thanks to the kindness of Sheri Lowe, we now have a unique view inside the Whitby WV Elementary School. Before seeing this photo, I had never seen the school interior in such detail. Below, from left to right are Mrs Violet Fink (Whitby School cook) and Mrs Ivory Garten (Whitby School Janitor) in the Whitby Grade School Kitchen. This was located in the basement and built in ~1952 (NOTE: The date of the kitchen construction at the Whitby Grade school was arrived at after speaking with several former students there. Thanks to all of you for caring that much.). Thanks again for sharing this wonderful picture with us Sheri! Believe it or not, Mrs Fink looked very much the same way in 1979. 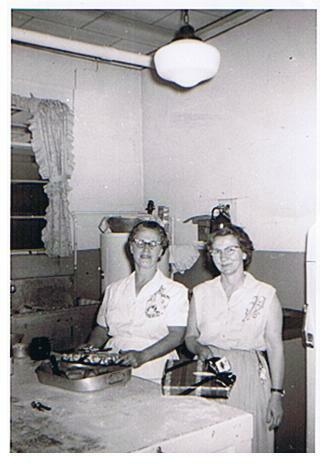 Mrs Violet Fink and Mrs Ivory Garten in the Whitby Grade School Kitchen.